The Arab Liberation Army (ALA; Arabic: جيش الإنقاذ العربي‎ Jaysh al-Inqadh al-Arabi), also translated as Arab Salvation Army, was an army of volunteers from Arab countries led by Fawzi al-Qawuqji. 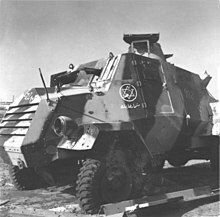 It fought on the Arab side in the 1948 Palestine war and was set up by the Arab League as a counter to the Arab High Committee's Holy War Army, though in fact the League and Arab governments prevented thousands from joining either force. Qawuqji returned to Syria to organize further forces and in March 1948 re-entered Palestine from Syria with the "Al Hussein," and “Al Qadsia” battalions, numbering 360 soldiers each. A final "Jabal al-Arab" battalion manned by 500 Druze soldiers and commanded by Shakib Wahab settled in Shfar'am. In the early summer of 1948 some Druze fighters,[quantify] mainly from Syria, along with Palestinian Druze from the villages of Daliyat al-Karmil and Isfiya on Mount Carmel, defected from the Arab Liberation Army to the Israel Defense Forces. These formed the core of the IDF's only Arabic-speaking unit, the Unit of the Minorities.